To gun-rights groups like the National Rifle Association, these statistics are evidence that gun control does not work. But to gun-control advocates, the numbers show that no state — no matter how tough the laws — is protected from firearms violence when guns are brought in from other states. 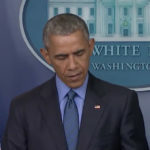 “The quality of your gun-licensing laws is only as good as those surrounding you,” said James Alan Fox, a Northeastern University criminologist. . . . In 2011, Massachusetts recorded 122 murders committed with firearms, a striking increase from the 65 in 1998, said Fox, the Northeastern professor. Nationwide, such murders increased only 3 percent from 1999 to 2010, the CDC says. There were increases in other crimes involving guns in Massachusetts, too. From 1998 to 2011, aggravated assaults with guns rose 26.7 percent. 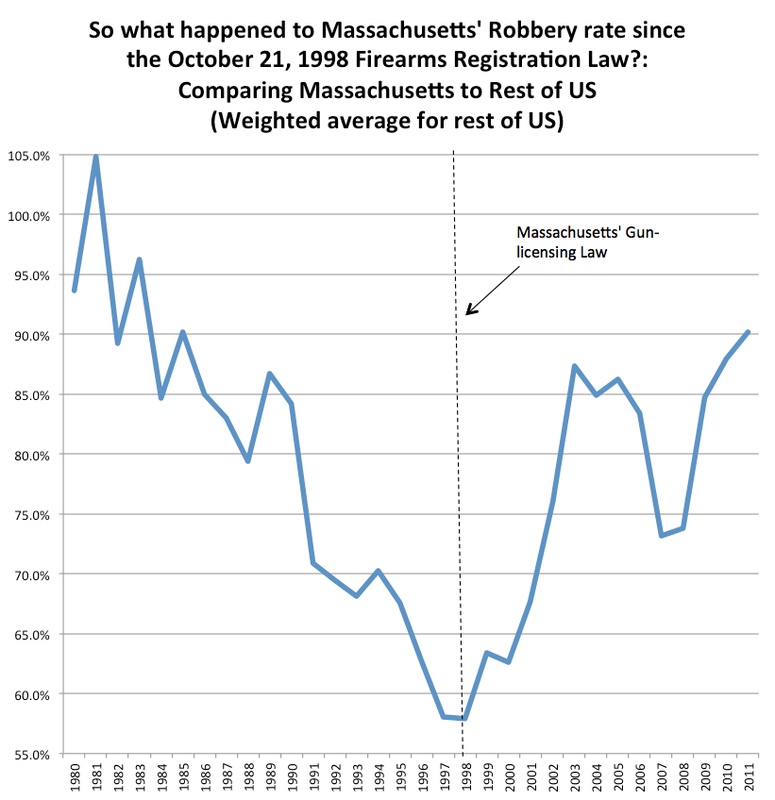 Robberies with firearms increased 20.7 percent during that period, according to an FBI analysis conducted for the Globe. . . . . 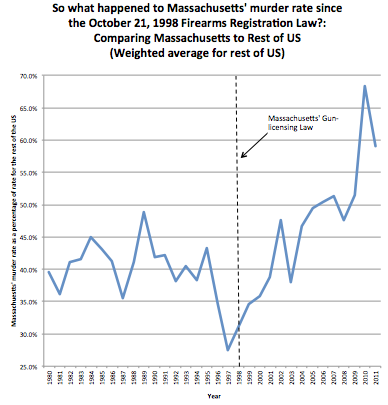 The number of registered guns in Massachusetts dropped by 86% — from 1,541,201 prior to the 1998 law to just over 215,000. It is hard to see how the presence of these other states could cause Massachusetts’ murder rate to rise. Those states were there before the 1998 law and criminals could obtain their guns before the law. 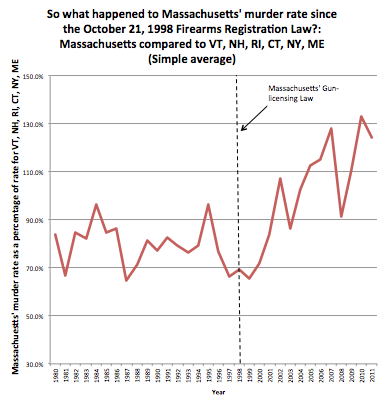 It is easy to see how the spillover might keep the crime rates from falling, but if the law helped at all, Massachusetts’ murder rate should have fallen relative to the rate in the rest of the US as well as the states that are Massachusetts’ neighbors. The results for robbery are even more dramatic. When you stated “The number of registered guns in Massachusetts” it should actually be the number of licensed individuals. Once a firearm enters the Massachusetts registry it actually never is removed, as there is no way of reporting a transfer to an FFL who subsequently transfers the firearm out of state. Licenses dropped precipitously because people still are walking around with “lifetime” issued FID (Firearms Identification) cards believing they are licensed, unaware that the 1998 change invalidated their now useless license. If lax gun laws in neighboring States are to blame for crime in a state with restrictive gun control laws, then that begs the question of “Why don’t the states with lax gun laws have just as high a crime rate?”. 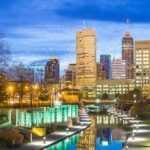 David M. Bennett – Well, first it helps to know what the states around the one in question are actually like. They are extremely different places just an hour away from Mass. Just because the laws work in one location doesn’t mean they will in another (otherwise we’d all have the same laws!). Just one important but by no means singular difference is the extreme population density differences between the states. There are 858 people per square mile in Massachusetts. Boston, ME has 645,966 people in it and Maine’s largest city has 66,000. You cannot buy guns legally in states other than your own without a background check and from a dealer. Any other statements about buying in other states is a flat out LIE. Key word: “legally”. We are discussing murders here. People who are willing to shoot other people are not going to balk at lying on a paper form or smuggling guns across state lines. But if guns stop being cheap and easy in Maine and New Hampshire, then from where are the state’s criminals going to smuggle guns? Canada? Population density is one thing; crimes per 100,000 inhabitants is another. As of 2010, the rate of gun murders per 100K inhabitants in Maine, New Hampshire and Vermont were 0.8, 0.4, and 0.3 respectively. For the New England states with the most restrictive gun laws. and the lowest rates of gun ownership (per US Liberal Politics, 2007), it was 2.7 in CT, 1.8 in MA, and 1.5 in RI. They throw that out there all the time, but they have no evidence to support it. 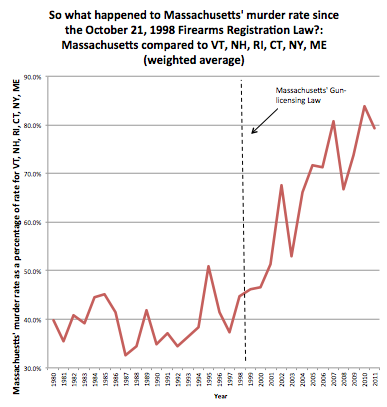 VT, NH and ME get blamed for the guns, but none can be traced back. Gun free zones are “Free Kill Zones!” Why isn’t the White House a gun free zone if it works so well? I bet Oama’s kids go to school under armed guard. Why do we have to expose ours? Because guns are only for the elite elected and other total assholes according to them. Leave the Constitution alone, let anyone who wants to buy a gun but yes even though the constitution does not say you need a back ground check do one and never allow a criminal buy one. If stopped on a traffic stop and a criminal is found with a gun then back to jail. Other wise arm everyone. Joshua, you obviously have never purchased a pistol out of state before anywhere in New England. As mentioned in a previous post a Federally Licensed Firearms dealer cannot legally sell a handgun to an out of state buyer unless that sale would be legal in the buyer’s home state, your drivers license and home state permit must be supplied at time of purchase and you must provide the FFL license # and shipping address of the home state FFL. Exactly what kind of lies do you imagine criminals getting away with on the ATF 4473 form that you’ve never seen? Multiple hand gun purchases? ATF 3310 must be filled out, guess what flags are raised when this happens? Talk to a lawyer, BATFE agent, FFL, or cop before you put pen to paper.